Chaotic Productions was born from the ashes of a home studio originally built for writing and composing the music of the band “Incantation of Chaos.” As time passed and Incantation of Chaos evolved in ViolentFix, the studio grew, at first into a small facility meant for local bands and close friends of Chaos and later into a multi-room state of the art pre-production studio catering to the most demanding of projects. The heart and soul of Chaotic Productions, centered around a Mackie D8B housed in a custom Argosy console, the studio offers full digital recording from start to finish with the option to insert as much analog gear as our hearts desire. The multi-track recorder shown is a Fostex D-160. Speakers include Mackie HR824s and Yamaha NS-10NCs (not shown). Rack gear pictured includes Lexicon MPX-1, Lexicon MPX-100, TC Fireworx, TC Finalizer, TC Gold Channel, DBX 1086, Rane MH4, and a Furman power distributor. 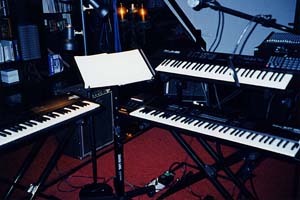 Anyone who has ever heard the music of ViolentFix would understand the need for a large midi-lab within the studio. 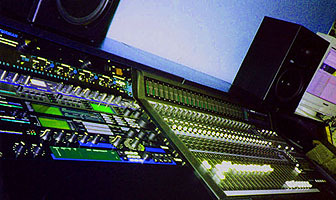 Since the photo was taken the room has changed slightly; currently a Kawia K5000 functions as controller to the large selection of rack-mount sound sources, including a Yamaha FS1R, EMU Audity, EMU E4XT Ultra, Roland XV5080, and others not shown. 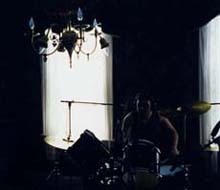 The largest room in Chaotic Productions is sonically sealed from the control room by two floors and capable of handling an entire live band for recording or rehearsal. (Functions as ViolentFix’s live rehearsal room and Eric’s personal writing space.) 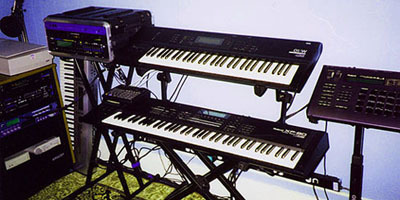 Gear shown: Roland XP80, Korg O1W, Roland JV-35, and Roland DR660. The downstairs also includes a smaller room excellent for a vocals, drums, or amp room. This room doubles as a large drum room as well as ViolentFix’s dining room. 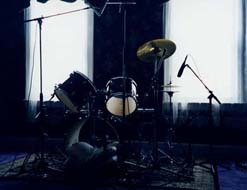 Chaotic Productions is able to handle nearly any size drum kit, with microphones for all occasions.